The holidays have been busy, but happily I am back for this week's fun Whimsical Windows/Delirious Doors, hosted by Toby. In this view, the era is the mid-1950s, the place being my grandparent's home on Oregon Avenue Steubenville Ohio, the person my Aunt Terry. The windows here seem peripheral to the giant holiday tree. "Grandpa did like big trees - and he loved displaying those trees in the picture window. I remember when I was little we had small living room windows. When it was decided to replace them, Grandpa insisted that the windows be simple plate glass so that everyone would be able to see his Christmas trees in full view. 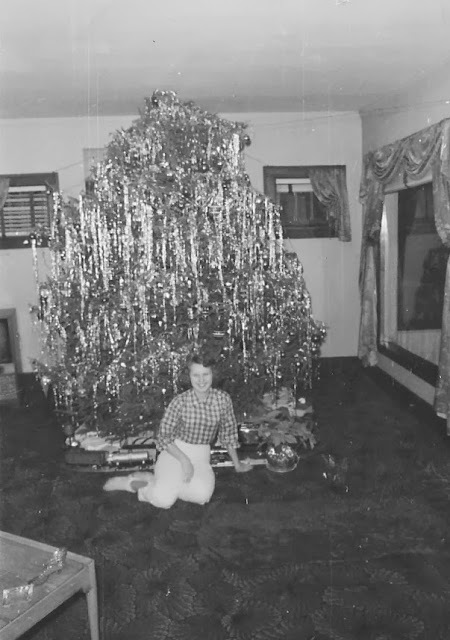 When the city busses drove down Oregon Ave. they slowed down so that passengers could gawk at the tree -- and everyone rode the bus in those days"
"And, yes, one year the tree was featured on page 1 of the [Steubenville] Herald-Star. The paper had been asking for several years to feature the tree but they wanted Grandpa to decorate it a week before Christmas. He would have none of that when I was small. But one year he gave in. It might have been this tree that was featured"
So the giant tinsel tree makes the window whimsical indeed! Happy, happy holidays to you and all of yours!